Hello! We are Carolyn Camman, Christopher Cook, Andrew Leyland, Suzie O’Shea, and Angela Towle of the UBC Learning Exchange, which is a little bit of the University of British Columbia in the heart of Vancouver’s Downtown Eastside (DTES). It’s a bridge for mutual understanding and learning between the University and a neighbourhood rich in community, art, and history, but whose residents face challenges, including homelessness, poverty, gentrification, and stigma. 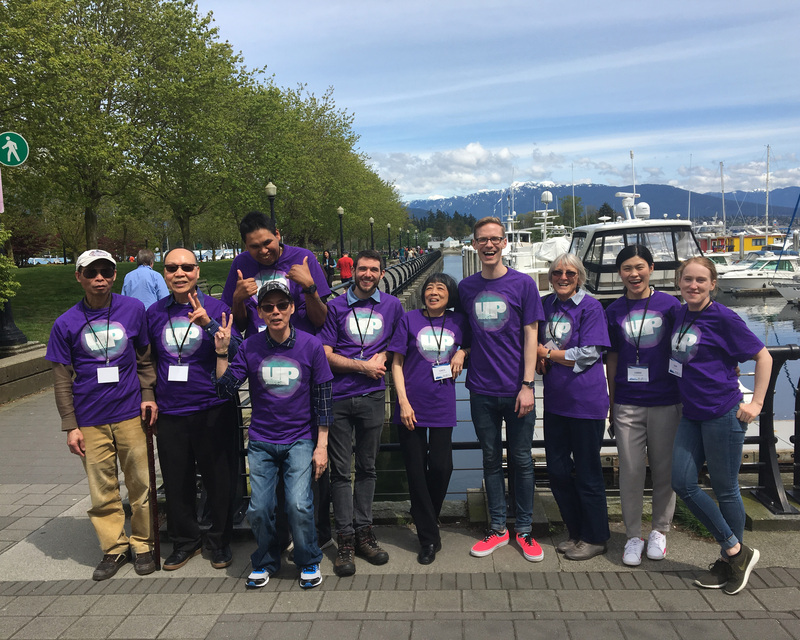 The UBC Learning Exchange acts as a member of the community, giving back to residents through community-based programming alongside experiential learning opportunities for students and support for community-based research. The Learning Lab supports members of the DTES community to engage in activities and scale-up their involvement by offering creative and educational activities in a flexible, low barrier format. In keeping with the arts-based principles of the Learning Lab and community engagement mission of the Learning Exchange, when it came time to make the results of a recent evaluation accessible to a community audience, the answer was obvious: put on a show! Voices UP! is a theatrical performance co-written and co-performed with the community members who contributed to the original evaluation. It not only communicated evaluation results, but deepened the evaluation itself. Through writing and performing the play, the cast learned more about evaluation and shared new stories and insights. Over its four-performance run from Spring 2016 to Fall 2017, the show evolved and grew. Hot Tip: There’s growing interest in using arts-based methods in evaluation. Live theatre is a dynamic and engaging approach that encourages people to connect with findings viscerally and immediately as part of a dialogue between performers and audience. In post-performance talk-back, one person said, “It was neat to hear the participants reflecting on what they had just done as well as what it meant to them to be a part of it.” Another commented that “seeing” the impact of the program was more persuasive than reading about it from a report or grant application. Lessons Learned: A performance doesn’t have to be polished or “professional” to be effective. Community members speaking in their own words is powerful and there are many creative techniques (like puppets!) that can bring evaluation findings to life. Having a conversation with the cast and giving introductions to audiences before performances about different ways theatre can “look” helped set appropriate expectations. Rad Resources: To keep Voices UP! going even after the curtains come down for the last time, the Learning Exchange staff and cast of program patrons came together to tell their story one last time, this time in a comic book. You can download this resource online for free: http://learningexchange.ubc.ca/voicesupcomic It was created using the same participatory process as the original performance and tells the story of how Voices UP! came to be, with tips and insights for anyone interested in using theatre methods to tell their evaluation story. Look up “reader’s theatre” and “ethnodrama” for more ideas about turning evaluation and research into plays. This is such an interesting idea! Do you have a recording or script you could share?